We are sure by now you have seen and enjoyed at least one of the amazing large brightly coloured snails on the streets of Brighton and Hove – if you haven’t, where have you been?! These brilliantly individual sculptures are to help raise funds and awareness for The Martlets Hospice. The Martlets has been providing hospice care and support in Brighton and Hove since 1997. Upon being lucky enough to be invited for tea, cake and a tour, Pip and Lucy were able to see what the invaluable funds go towards. They have 18 beds in the in-patient unit but most of the care is delivered in the community – an amazing resource for those who want to remain at home. Not only this, the day centre offers some incredible initiatives from gardening, to craft to a brilliant choir. The Martlets works so hard to take away the stigma that hospice’s are for immediate end of life care – they are also there for anyone in the position of having a life ending illness – this can be years or months – they want to help everyone. However, this cannot be run without local support and fundraising. On the 15th September this year, 50 large and 53 junior snails were unleashed (albeit slowly!) on to the city! The Snailway has been presented and coordinated by Wild In Art. The Martlets and all involved are hoping that the unique mass participation event will engage the public and all those visiting Brighton and Hove. 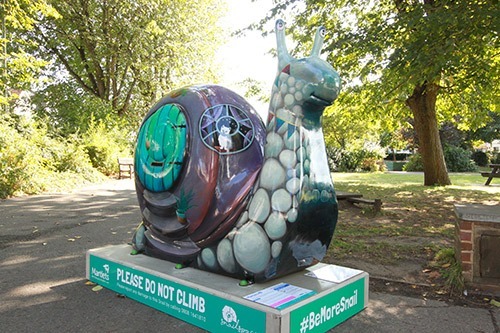 Each snail has been designed and created by local and national artists and sponsored by local businesses and even celebrities – Fat Boy Slim has one! As a sponsor, we attended a lovely evening of fizz and canapes to look at the submitted designs and pick our favourite before the snailway started. We could completely understand the thinking behind a snail for The Martlets. Their hospice care helps people do what they love, in the time they have left. For us, we saw our design and knew it had to be ours! With our snail location being in Stoneham Park, we saw Home Sweet Home by Illona Clark, and could just imagine the fairytale snail being perfect in the park! With the amazing tiny details, the cat, the fairy, the small snail and the bunting – it was a magical house! We knew we wanted a snail with a shell being used as a home – as houses are our thing! We just felt that all children visiting the park could create all sorts of stories about Home Sweet Home and the characters on it. When Home Sweet Home arrived in the park – we were so excited! We teamed up with Friends of Stoneham Park to help with a park clean, which we did last weekend. This was great to help clear up litter, de-weed and make the park look clean and tidy for all visiting the snail! We want as many people as possible to visit Home Sweet Home and do the whole trail (or as much as you can!). Our unlocked reward for visiting is a yummy treat too – as we teamed up with Hove Patisserie, so we suggest you pop down and unlock the code! The app can be downloaded from the App store, and £1 goes straight to The Martlets. For us, just sponsoring wasn’t enough – we wanted to encourage our community to come together and appreciate not only the snail – but what it represents. 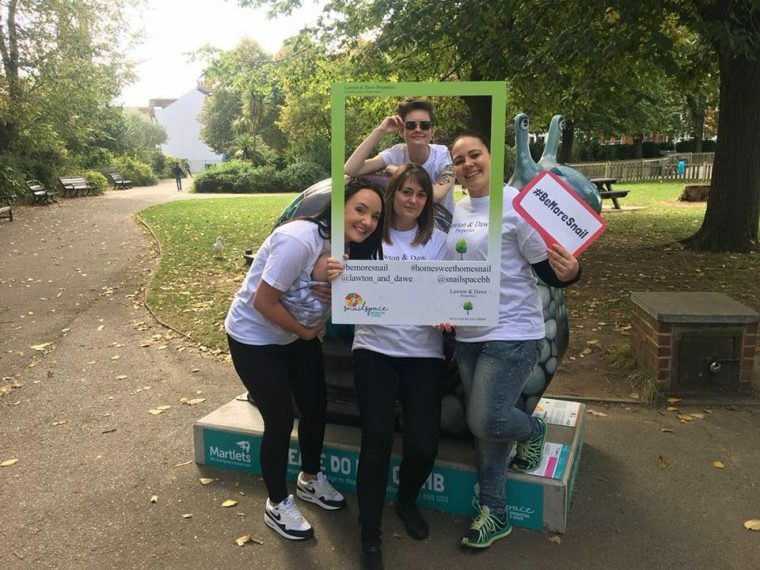 Therefore we are holding a yoga based, slow down and #bemoresnail session in the park on the 27th October at 10.30am! Anyone can come and join in – bring a mat and some enthusiasm and all your loose change to pop in a bucket. It is being run by the wonderful Alex Smallman of Uber Mummies – come and get involved! Also, we are holding a ‘design your own snail’ competition in half term on the 2nd November in the Snug Café in the park! A chance to unleash your kids creativity! Art supplies provided, coffee and cake easy to buy, and there are even a few prizes – our wonderful artist Illona Clark has said she will judge, which is amazing! Please let us know if you would like to join in!